The bloodied Police Officer 2 Mervin Capellan y Tugbo lies on the driver seat of Mahindra patrol car. Photo by Monreal Municipal Police Station. Legazpi City, [09.30.17] – A 37 years old Police Non-Commission Officer in the island of Ticao in Masbate has died in an ambush this morning while on board on Mahindra patrol car going to a car wash, police report said. According to PRO-5 Regional Public Information Officer, Police Senior Inspector Malu C. Calubaquib Police Officer 2 Mervin Capellan y Tugbo, 37 years old, of legal age, driver and is assigned in Police Community Relations PNCO of Monreal Municipal Police Station. The ambush occurred at 6:15 o’ clock in the morning today near the municipal dump site at Sitio Tambarong, Barangay Poblacion, Monreal, Masbate. 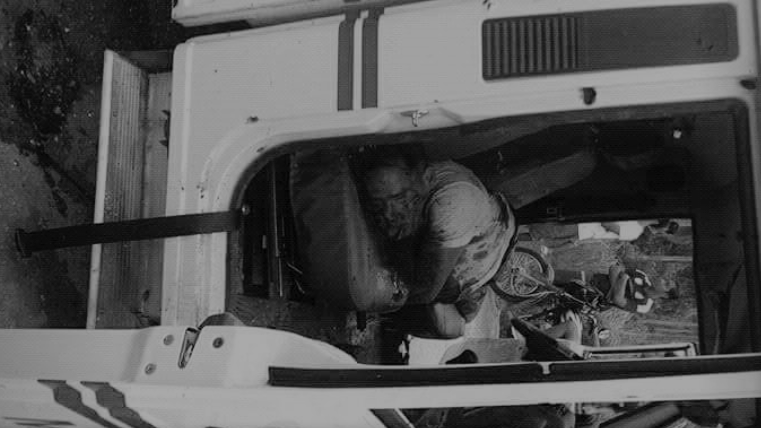 P02 Capellan was driving alone when ambushed by more or less less twenty unidentified communist terrorists. He died on the spot due to multiple gunshot wounds on his head and body. The rebels divested their victim of the following items: uniform, issued short firearm GLOCK GEN17 with SN 53537, personal mobile phone and wallet and fled after the incident toward the mountainous portion of Barangay Poblacion, Monreal, Masbate. Responding policemen has recovered 6 empty cartridges from M14 rifle, 7 empty shells M16 rifle and 27 small pieces of shrapnel suspected improvised explosive device.